One of the biggest “gotchas” that production companies can encounter is lost or corrupted footage. It sounds simple: “Copy camera cards over to hard drive.” But it’s the most critical job on the set. You mess this up, and you can lose that great performance, that wonderful camera work, those awesome sets. So to avoid this pitfall, let’s look at the tools you need. First of all you need a computer and hard drives. Preferably two (or more). Industry best practice is to take the camera card, copy it over to two different hard drives. 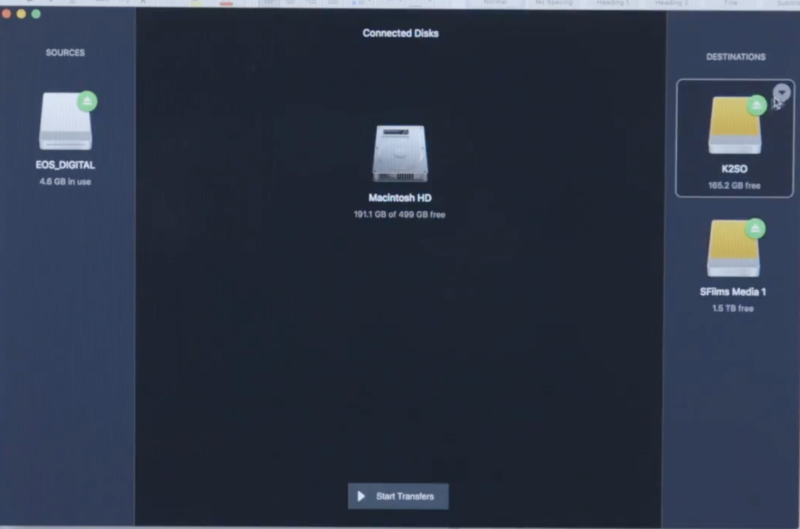 And make sure you copy to each hard drive from the card—don’t copy to a hard drive, eject the card, and copy from the first hard drive over to your back up hard drive. If you have anything corrupt, you just copied that over. Always copy from the camera card to your primary hard drive and your backup hard drive. Now when you copy, you can use Finder (if you’re using Mac OS) or windows file manager and just copy the contents of the card over to the hard drive. But how do you know there was nothing corrupted in the transfer? There are several apps that will copy for you, and run verifications (check sums) to make sure every single 1 and 0 was copied over. We use Hedge for the Mac—it allows you to copy straight through from card to hard drives, which speeds the transfer up a bit, instead of going through your computer bus. Have a system. Use one color box or colored tape for cards that need to be transferred, and another for cards ready to go back to the camera team (they’ve been verified). In addition to the physical system, make sure you have a good file management system on the computer. A master folder should be created for the Production. On smaller shoots, it might be that you have other jobs on the set—make sure you don’t get confused on file management. For our video on the small video crew file management system, click here. What good is it to help craft a well shot scene, only to mess up the transfer and that scene get deleted? I’d say your file management duties are more important than any other job you might have on the set. If you mess up, everyone’s work was practice for the re-shoot. Yes it’s pressure—that’s why you have to have a system and follow it religiously. One last word—I used the term File Management instead of DIT. A true DIT also does first pass coloring and is responsible for the image being created on the set. In corporate video, it’s mainly just managing the data from the cameras. Remember—keep it straight!